As a child of the 50's, Karen lived in a tiny house on a tiny lake with her parents and two older sisters. Then the TV came along and Howdy Doody, Roy Rogers, The Lone Ranger and The Cisco Kid joined the family. 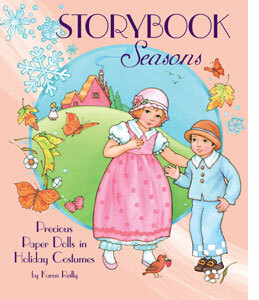 When she wasn't pretending to be queen of the West she drew paper dolls for the neighborhood kids. She also spent time at Marshall's drugstore checking out the competition… those artists that illustrated all those lovely 50s movie star paperdoll books like Debbie Reynolds and Doris Day. Cute was the look of the day and they were CUTE. Karen's older sister kept her up nights by asking Karen to keep her company watching old movies on The Late Show. Her sister would fall asleep, but Karen was wide awake and hooked on all those old films. "Camille" always seemed more interesting than another episode of Rin Tin Tin. Karen had thoughts of a career in art and before long she graduated from Miami University with a B.F.A. in painting and art history. She pursued a "career in the clouds" with United Airlines in Chicago, but doing something more creative was always on her mind. Then Karen became an artist in training at American Greetings where she worked on a variety of products and slowly climbed out of the training phase in the Humorous/Juvenile Department. There was always the chance of working on paperdoll product for cards and that was a favorite assignment and a return to childhood. Working with other artists was the biggest benefit of her job and she eventually moved up from artist to art director. Now Karen's time is spent in her studio doing freelance illustrations for various publications and paper doll projects for Paper Studio Press.